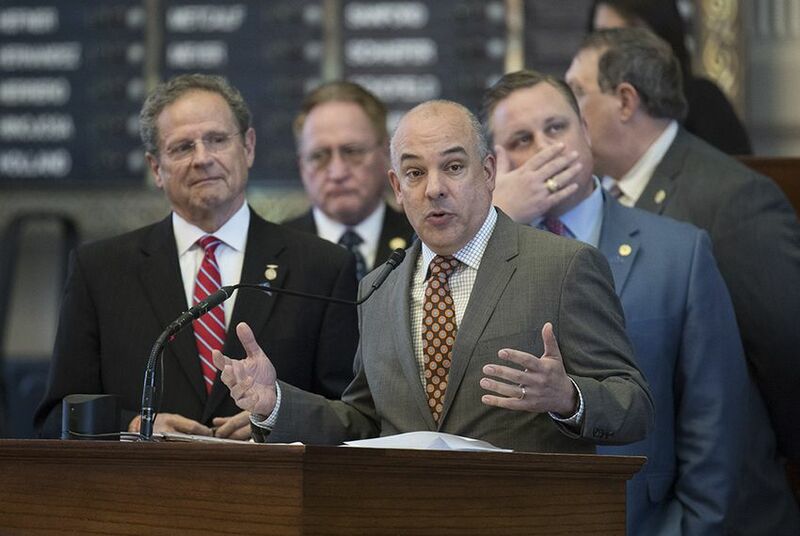 Democrats in the Texas Legislature outlined their priorities for the upcoming special legislative session on Monday, focusing on several issues that did not appear on Gov. Greg Abbott's agenda for the session. In a joint press conference, Democratic leaders in both chambers vowed to champion the issues "that matter to all Texans," and to fight for legislation that will protect "our kids, our economy, our health and our communities." Priorities for the Democrats include school finance reform and reducing maternal mortality — both of which are on Abbott's list in some capacity. Several other issues, including criminal justice reform and equal pay, are not — and are unlikely to make it to the floor for a vote. Though they trotted out an ambitious list of legislative priorities, Democrats will likely spend much of the next month playing defense against measures like the so-called "bathroom bill," a special session priority for Lt. Gov. Dan Patrick that Democrats have called discriminatory. There were even rumblings earlier this summer that Democrats might skip town in an attempt to derail the special session. State. Rep. Chris Turner, D-Grand Prairie, chair of the House Democratic Caucus, said he hopes the governor will consider formally adding some Democratic priorities to the special session agenda, criticizing many of the current agenda items as "dangerous," "divisive" or "non-issues." "If we're going to have this costly special session, we ought to use it to get some real work done for the people of Texas," Turner said, adding that "there's nothing to prevent" legislation outside Abbott's special session call from being filed, heard in hearings, debated on the floor and even passed. State. Sen. José Rodríguez, D-El Paso, the chair of the Senate Democratic Caucus, criticized Lt. Gov. Dan Patrick's focus on measures that did not pass the regular session, including the controversial "bathroom bill." Rodriguez also said that Senate Republicans do not have enough votes to suspend certain chamber rules, a move that allows legislation to pass through the Republican-dominated chamber more quickly. "We're going to be spending taxpayer dollars for 30 days. Let's spend our time on measures that actually matter to people, that move peoples' lives forward," Rodriguez said. Democrats and Republicans agree on the need to address school funding and teacher pay — though lawmakers on opposing sides of the aisle disagree on how best to go about doing it. Patrick last week laid out a proposal to fund teacher bonuses using money from the Texas lottery, and House Speaker Joe Straus has supported a bill that would've injected $1.5 billion into public schools — a measure that could reappear in the special session. Democrats on Monday advocated for increasing the state's share of the education budget, and also for funding teacher pay increases through the Rainy Day Fund. "Everyone knows the school finance system is broken," said state Rep. Donna Howard, D-Austin, who filed House Joint Resolution 18, a constitutional amendment that would require the state to supply at least 50 percent of the public education system budget — as opposed to 38 percent in the current year. And state Rep. Shawn Thierry, D-Houston, said the legislation she filed to address high rates of maternal mortality in Texas should be somewhere "we can all find common ground." "We have to do something to save our mothers," Thierry said. Still, some Democratic priorities described Monday are unlikely to enjoy bipartisan support — or even see much debate, as presiding officers in both chambers are unlikely to refer such bills to committee, and any measures not on the governor's formal call could be easily shot down by administrative points of order. These measures included bills to close the gender wage gap, increase the state's minimum wage, expand voting by mail and increase the age of criminal responsibility. One measure, state Rep. Ramon Romero's House Bill 53, targets the so-called "show me your papers" bill signed into law this past legislative session. Both houses will gavel in at 10 a.m. Tuesday morning.